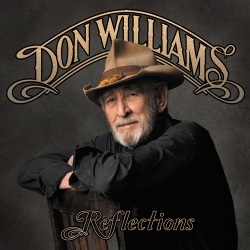 March 11,2014 — Sugar Hill Records has just released "Reflections", a new CD from Don Williams. Working again with longtime producer Garth Fundis, Don releases his second CD since his return from what turned out to be a brief "retirement". Known as country music's "Gentle Giant", the Country Music Hall of Fame member has released nearly 30 original albums, most recently the highly acclaimed "And So It Goes", in 2012. It's a lovely collection of songs, about love, the working man, and family, all themes he has sung about in the past. The songwriters include Townes Van Zandt ("I'll Be Here In The Morning"), Merle Haggard ("Sing Me Back Home"), Jesse Wincheser ("If I Were Free"), and Steve GIllette & Rex Benson ("Healing Hands"), and every one of them is a master of his craft. WIth the songs in the hands of Don Williams, the result is an album that might be Don's best ever. Don's style is a mixture of country and pop (he listened to both growing up), and appeals to a wide audience, He has been a strong presense on the airways and music charts for decades. He is one of many major recording artists to have recorded a Gordon Lightfoot song; the often covered "If You Could Read My Mind" was his choice. And, showing that his musical taste overlaps with mine, he has also previously recorded three songs written or co-written by Steve Gillette; "Back on the Street Again" by Steve alone, and two songs by Steve and Charles John Quarto: "(That Song About) The River" and "The Old Trail" (the latter as a duet with Kathy Mattea). And now, on Reflections, he has recorded a fourth song co-written by Steve, "Healing Hands". 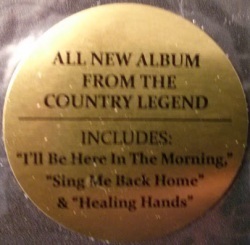 I became aware of the latest CD project early last June, when Rex Benson, another frequent co-writer with Steve, tweeted that one of their songs, "Healing Hands", had been just been recorded by Don Williams. That meant that a new Williams CD was in the works, but there was as yet no certainty that the song would make the cut. "Healing Hands" had been written 21 years earlier, and released on Steve's album, "The Ways of The World" — an album that has already produced four songs that were recorded by major artists: the two Charles John Quarto co-writes that Don had previously recorded, plus "Bed of Roses", written with Rex Benson, and recorded most famously by Kenny Rogers, and "Grapes on the Vine", written with Charles John Quarto, and recorded by Waylon Jennings, Tony Rice and others. Steve & Rex have collaborated before, on "Bed of Roses", mentioned above, "Glass Houses", recorded by Tammy Wynette (duet with Joe Diffie), and "Unto You This Night", which Garth Brooks put on his very popular Christmas album. Any song penned by Steve & Rex is likely to be notable, and "Healing Hands" is no exception. Don's new album is available now from Amazon.com (CD), Amazon.com (Vinyl), Amazon.com (MP3 album), and from Amazon.ca and Amazon.co.uk. I have listened to all the songs, in order, many times. This is a great CD - one I would probably not have discovered had I not been a Steve Gillette fan and friend. I enjoy hearing covers of his songs, just as I enjoy hearing covers of Lightfoot songs, and have always enjoyed good Country music, especially the traditional county sound that Don exemplifies. Don's style is reminiscent of some of Lightfoot's late 60s and early 70s recordings; those which were as much country as folk, and resulted in many covers by country artists (such as Marty Robbins, Johnny Cash, and Williams himself). Lightfoot's early "Ribbon of Darkness" was a #1 Country hit for Robbins, yet he did it in Lightfoot's style which he admitted himself in the liner notes to the original album. As a devoted Lightfoot fan, I'd compare the sound with that of two of the wonderful "never before released" songs on the Songbook boxed set: "Too Much To Lose" and "Heaven Don't Deserve Me", both recorded in the "Old Dan's Records" sessions (1972), but not released until 1999. I really have to comment on Don's voice; it is still every bit as beautiful as it was decades ago. Not all singers keep their voices throughout their careers, and it is just wonderful listening to one who has done so. For me, the standout tracks are the first song - and first single - "I'll Be Here In The Morning", (Townes Van Zandt), "Sing Me Back Home" (Merle Haggard), "Stronger Back" (Doug Gill), and of course, Steve's song, "Healing Hands" (Steve Gillette & Rex Benson). The Steve Gillette cover is simply wonderful. The arrangement is very much Don's style, but his vocals are very reminscent of Steve's, in both inflection and phrasing - so, I absolutely love it! Just as with the Marty Robbins' cover of Lightfoot's song, the voice and arrangement were the recording artist's, but the feel and style were very reminscent of the songwriter's. If you are curious, you can listen to a clip of Steve's version, and read the lyrics at his website: Healing Hands lyrics and clip of Steve Gillette's version. I purchased this CD with my own money, and it was worth every penny.